There are some countries which are always in turmoil and that affects not only the people, but also animals and the environment ! One of the world’s bloodiest conflicts claimed more lives recently after the President of South Sudan was accused of “violating” a peace agreement by unilaterally creating 28 new states.At a stroke, President SalvaKiir announced that South Sudan’s 10 existing states would be divided into 28. The government said this decree would come into effect immediately, without requiring approval from parliament.South Sudan has endured almost two years of civil war between Mr Kiir’s government and a rebel movement led by RiekMachar, a former vice-president. The fighting has claimed tens of thousands of lives and driven 2.2 million people from their homes – 20 per cent of the entire population. Away from political turmoil, the landscape of South Sudan has turned a verdant green under the annual rains, beginning one of the greatest wildlife spectacles on Earth. At least one million antelopes are now converging on a vast savannah east of the White Nile.This mass movement of two species - the tiang and the white-eared kob – rivals the wildebeest herds of the Serengeti as the biggest migration of land animals in the world.During South Sudan’s long war for independence from Khartoum, no outsider could be sure whether this migration was still happening. After the fighting ended in 2005, aerial surveys discovered that vast herds had somehow survived – and the antelopes were still travelling the same routes they had used for millennia. Yet South Sudan is now enduring another war and its unique migration is threatened all over again. 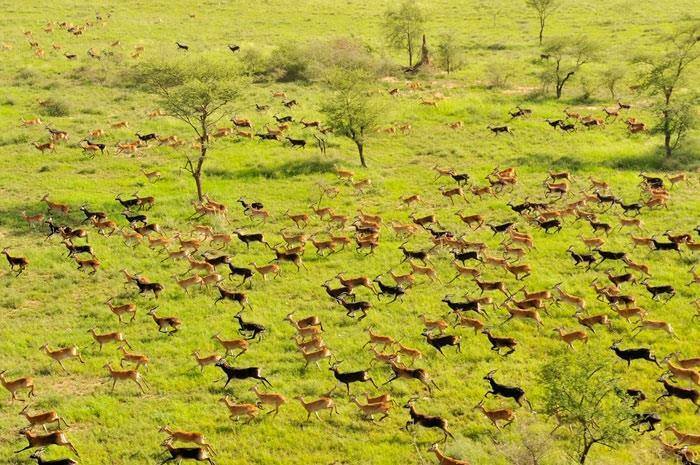 At present, about a million white-eared kobs are moving westwards from their dry season habitat in Boma National Park to the plains near the White Nile. They will be joined in Bandingilo National Park by 125,000 tiangs, which migrate southwards from their dry season refuge in the swamps of the Sudd region. Animals are not savage – it is men who are so cruel to them and to fellow mankind. Elsewhere in a tragic and savage end, elephants werekilled by men who were supposed to be protecting them.A tragic report states that elephants were slayed using cyanide in Hwange National Park, Zimbabwe. Poachers made off with three ivory tusks after the killings, officials said. In Oct alone 62 elephants had been killed - lying slaughtered on the ground with their heads barbarically hacked off, the elephants believed to have been killed by the very men who were meant to be protecting them, shows the ugly side of mankind. Staff at Hwange National Park have reportedly not received their already low wages and it is feared that the elephant killings in the park may be a form of 'protest' against management. Horrific pictures that are in circulation show their remains scattered across the dusty ground after they were mutilated for their tusks. The most recent attack, which took place earlier this week, saw 22 elephants, including babies, poisoned using cyanide hidden in salt stones and oranges. Rangers working in the park are notoriously badly paid for a job where they are at constant risk, fighting off heavily armed poachers. According to an inside source, rangers have only just received their pay due last month and management have failed to pay for fuel for the pumps for the park's watering holes, The Telegraph reported. 'I am afraid there are serious management problems within parks,' an unnamed source from Zimbabwe's National Parks and Wildlife Authority told The Telegraph. The discovery of 22 elephant carcasses were made in the in park's Sinamatella area alongside 35 tusks, probably to cyanide said Caroline Washaya-Moyo, spokeswoman for the parks and wildlife management authority. She added: 'We continue to lobby for deterrent penalties for people found with poisonous substances such as cyanide. We can't continue to lose wildlife at such a rate. 'Rangers are now investigating how many of the elephants - who resided at the same park as Cecil the lion, who was shot dead by dentist Walter Palmer in July - had fully developed tusks.Speaking to the Associated Press, Washaya-Moyo said: 'We are now trying to check how many elephants had fully developed tusks because babies are among those killed. The rate at which animals are getting decimated is alarming and many other species are also dying from the cyanide used by poachers to target elephants. Poaching is common in Zimbabwe's game parks. Elephants and rhino are the main targets for poachers because of their tusks and horns, which are smuggled to eastern Asian countries.Last year, more than 300 elephants died in suspected cyanide poisonings. Earlier, Zimbabwe Environment, Water and Climate Minister OppahMuchinguri blamed a ban on elephant sport hunting by the U.S. for increased poaching in the country.She said'All this poaching is because of American policies, they are banning sport hunting. 'An elephant would cost $120,000 in sport hunting but a tourist pays only $10 to view the same elephant,' she said, adding money from sport hunting is crucial in conservation efforts. Sad is the plight of the animals getting killed caught between poachers and rangers.